Hi there friends and fellow crafters. LeeAnn here today with another project from the Limited Edition Project Kit from White Rose Crafts. This kit is in pre-order status right now and will begin shipping in April. There is a limited quantity available, so please do not delay. For today's project I used cardstock from the kit for the front panels of my GateFold card, and one of the journaling prompts for the sentiment. I used a brad to mount one of the charms that came in the kit to use as a closure for the front. 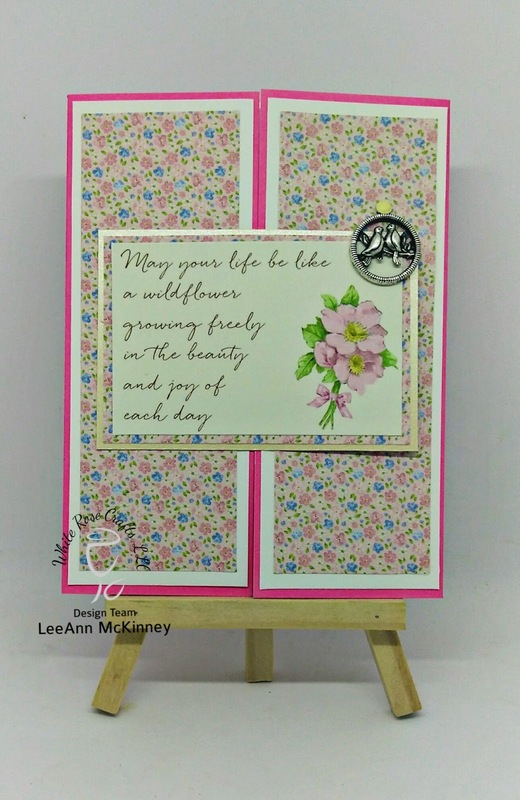 Making this card I used a 5.5" x 8.5" piece of hot pink card stock from my stash. I scored this at 2.25" from each end to make the gatefold. I then cut 2 panels 2" x 5.25" from white cardstock, and then 2 panels of 1.75" x 5" from the cardstock in the kit. For the sentiment panel I cut a piece of the Autumn Hay at 3.5" x 2.5" and mounted the sentiment panel on top. All panels were mounted using double side tape available in the shop. I hope you have enjoyed this projects today. Please see the great products available at the White Rose Crafts online store. This kit will be available April 1. However you can Pre-ORDER NOW!!! These kits are STRICTLY LIMITED EDITION - when they're gone, they're gone! 1 12"x12" sheet of matching toppers.